Every Christmas, around the world, children look forward to the arrival of a very special visitor. Although the visitor varies in appearance according to local legend, each gift-bringer personified the love and spirit of giving that are at the heart of our holiday season. St. Nicholas, a bishop in Asia Minor in the 4th century, was well-known and loved for his kindness and great love for children. 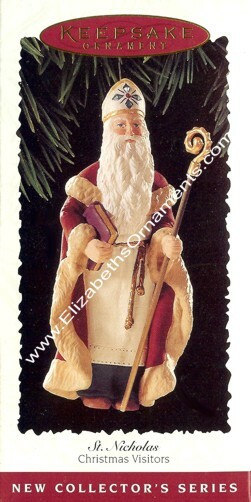 He is the basis for the Santa Claus we know today, and is the first Christmas visitor to be featured in this new series. The series will celebrate the legend of a different gift-bringer each year. Ornament is MIB with normal box aging. Has Price Tag.